The Flag of Mexico, as it is today, was adopted in 1968. But Mexican flag history really goes back over 600 years earlier than that. In the early 1300s, so the story goes, the wandering tribe of Mexica people were looking for a home. Persecuted and cast out from other nations, they believed that their god, Huitzilopochtli, would show them a sign - to guide them to their new settlement. The Mexica people (who would become part of the mighty Aztec Empire) believed that they would see an eagle perched on a prickly pear cactus, and that's where they would build their new city. But then Mexican flag history took a strange turn. According to the legend the Mexica people did indeed see the sign - but it was on an unlikely spot. A small, swampy island in the middle of Lake Texcoco. Just as the Mexican people still are today, the Mexicas were resourceful. They invented the chinampas system, which allowed them to create small garden islands, which would eventually help to dry out the land. As it dried, they built. Causeways were built across the lake to allow access to the island. In 1325, the city of Tenochtitlan was born. Check here for more on Mexico City history, from then until now. When the Spanish saw this symbol of the empire - an eagle on a cactus, they misinterpreted the red and blue currents coming from the eagle's mouth. Someone thought it was a snake, and the symbolism of the eagle and snake stuck. 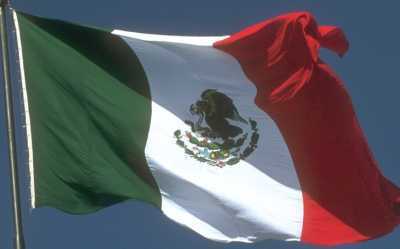 The next chapter of Mexican flag history began in 1810. On September 16, the priest Miguel Hidalgo y Costilla and a group of revolutionaries began the fight for the independence of Mexico. Though this first phase of the revolution failed, eventually in 1821 Mexico gained its independence, and in 1824 the Estados Unidos Mexicanos (United Mexican States) were formed. The flag with red and green, showing the eagle in the middle was first used in 1821, although it looked a little different than the current design. Read a bit more about Mexican Flag history and see an early version here. Throughout Mexican flag history, the design has been changed several times. The current flag came into use on the 16th of September 1968. It was officially confirmed by law on the 24th of February 1984. Generally, throughout the years, there has always been an eagle and there have always been the three colours, green white and red. The ratios have changed, and the coat of arms have also changed numerous times. The meaning of the colours has also changed. When they were originally adopted in 1821, green stood for independence, white for religion (Roman Catholicism) and red for union (between Americans and Europeans. This union between peoples native to Mexico and Spaniards in Mexico in particular was instrumental in winning the war). At the end of the Mexican flag history, certain symbols and meanings were agreed upon. The new meanings of the colours are fairly recent: Green is hope, white is unity, and red is the blood of heroes. These meanings are not enforced by law, so they may continue to change. Today the coat of arms is in the centre of the flag, showing an eagle eating a rattlesnake perched on the nopal (prickly pear) cactus. Underneath is a garland. On the left the garland is green oak, a symbol of strength. On the right is a laurel branch, symbolizing victory.